Last week was… not the best. I should clarify. It wasn’t bad. It was simply stressful. And hectic. And tense. And all of the things that a week that where the catalog and orders go to press usually is. Thankfully, the week ended with the Nerd Prom — the Employee Appreciation Party (or the Christmas Party) — and after the week that had been, the Nerd Prom was muchly needed. Last week, the Christmas tree in the office lobby was put up, and it was decorated, as it always is, with stockings for the Salvation Army’s Angel Tree program. I did the Angel Tree for the first time three years ago — and enjoyed it — but for various reasons, mainly not checking the tree at the right time, I didn’t the last two years. As I walked past the tree Wednesday afternoon — or was it Tuesday? — I looked at the stockings on the tree, saw one for a “Boy Age 7,” and took it. My week had been overwhelming to some extent, and the thought of helping someone who needed help I saw as a way of balancing the karmic scales. Unlike three years ago, where I had a hang tag that had a short want list and clothing sizes, all I had to go on this year was “Boy Age 7.” I then got some clarification from Human Resources about whether or not I had to use the stocking; after all, three years ago I didn’t. I was told that I could put anything in whatever I wanted; the little bit to identify the recipient was all that was necessary, and it needed to be visible. I could work with that. Clothing was out — I had no idea what size to buy for, and I didn’t want to take a chance of buying the wrong size. “A gift receipt!” you’re thinking, and I considered that, but then I thought through the problem — would this child have an adult who able and willing to go to the store I bought the clothing from to exchange it? I sadly realized that wasn’t an assumption I could make. I settled on following the gameplan from three years ago — buy a bunch of small, inexpensive stuff, wrap it individually, then box it in a Diamond shipping box and wrap that. Let’s see what I did. That’s the stuff, except for three things that I left on my coffee table, pre-wrapping. I decided early on that I wanted to get my Angel Tree recipient some coloring books. And I did — I found two at Ollie’s Bargain Outlet that I thought would work. One was a Spider-Man coloring book, the other was a Star Wars Rebels coloring book. Coloring books require crayons, so I picked up a box of crayons at Big Lots Saturday night before the Nerd Prom. Also picked up at Big Lots on Saturday night, this set of Batman-themed Hot Wheels cars! Not pictured, there was also an off-brand LEGO-compatible building set of a fighter jet that I found at Big Lots. It was a decent sized set, about 160 pieces. This gave him two things to build and play with — the TIE Fighter and a fighter jet. I, personally, was more interested in the road construction crew set Big Lots had — it had a concrete truck! — but since I’d already purchased the TIE Fighter, I wanted something else air-related so they could dogfight. I thought my recipient needed puzzles. I bought three. One was a lenticular Avengers puzzle, and then I bought these two Star Wars puzzles. I saw this book, The Peter Yarrow Songbook: Favorite Folk Songs, at Ollie’s, and I was instantly taken by it. It’s a picture book, and two dozen classic folk songs are printed and illustrated. Plus, there’s a CD of Peter Yarrow (the Peter of Peter, Paul, and Mary) performing the song. It, too, was the sort of thing my parents would have given me at that age. Not pictured, I also bought a book on the Smurfs at Ollies. It was a cute introduction to the characters. This I pulled from my personal collection. Patrick Mconnell’s Mutts, which chronicles the adventures of the cat Mooch and the dog Earl, is one of my favorite comic strips, and it would be the right speed for a seven year-old. Not pictured, there was also a Transformers calendar that I bought at Dollar Tree. Also not pictured (and not wrapped, because there was no good way to wrap it) was the first issue of Titan Magazines’ Star Wars Rebels magazine; this was left on the giveaway table at the office a few weeks ago, and I decided to pass it on. 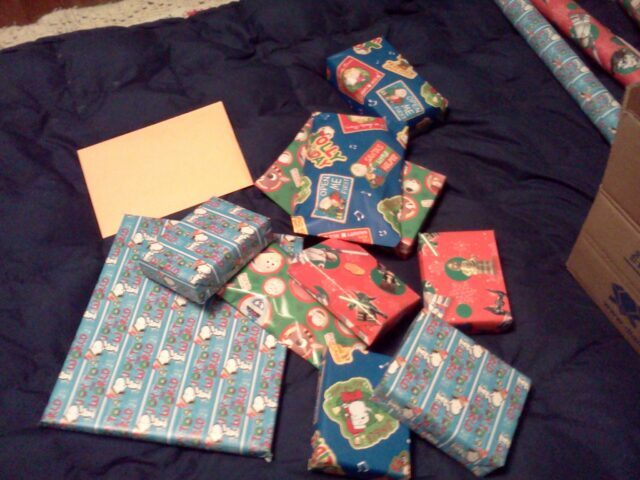 And here’s the resulting wrapped packages. I didn’t have a lot of room left over, and I couldn’t have fit anything else into the box even if I’d wanted to. I taped up the box then wrapped it in A Charlie Brown Christmas paper that I also bought at Big Lots on Saturday night. This morning I took the box into work, taped the necessary identifying materials to one side, and turned the package over to Human Resources. All told, not counting the Mutts book out of my personal library, this came in under thirty dollars. The most expensive things were the Peter Yarrow book and the LEGO-esque jet fighter; each of these were five dollars. My goal was to buy strategically, to get a lot of things, and I’m sure there’s stuff there that I’m sure he’ll enjoy. I can’t fix the world. Sometimes, in my darker moments, I’m not even sure I can fix myself. I can make things better for one person, though, at least for one day. I’ll count that as a win.